Are you dreaming about the best cruise honeymoon? Cruises may seem like the easy path to planning a honeymoon, but there’s more to think about than you may imagine. You have to determine a destination because you will spend some time off the boat, and you want those land excursions to fit your idea of a fulfilling honeymoon. Then you have to select a cruise line with ships that offer amenities and activities that you’ll enjoy. You will want to do more than sit in your cabin, so the rest of the ship is important. Add in concerns about what you’ll eat, the hours that the amenities are available, and who may share the ship with you, and this becomes a bit more complicated. If you’re flexible about your destination, the length of the cruise, and other details, you’ll find that you have more options available within your preferred travel dates. To help you find the best cruise for your honeymoon, consider our top picks from some of the leading cruise lines. The Sea, Sky, Safari Cruise. This is a unique offering that combines a yacht cruise with a private jet ride and an exciting African safari experience. This is a more expensive package that not all couples can afford, and the dates are more limited than with other cruises. Caribbean Cruises. If you want to visit some of the more intimate and secluded Caribbean locations, you have an advantage with SeaDream. The yachts are much smaller than the cruise ships used by many other cruise lines, so they can access ports that aren’t accessible to larger ships. This cruise line maintains a fleet of power yachts as well as sailing yachts, and you can select from a variety of trips available on both types. They often offer incentives for booking their cruises, such as free hotel accommodations for your trip. The food served on these ships is also more upscale than what you will find on many larger cruise ships. Here are some of our top picks from the Windstar lineup. Dreams of Tahiti. This is a seven-day cruise that takes you to multiple Tahitian islands. You’ll spend a lot of your time off the ship enjoying the beaches and activities like swimming and snorkeling. You’ll even get to explore the rainforest. Pearls of the Indian Ocean. This is one of the more unique cruise options because it touches on multiple destinations throughout Indian and Arabia. It lasts for 16 days and will immerse you in culture and history as well as stunning beaches and exciting nightlife. 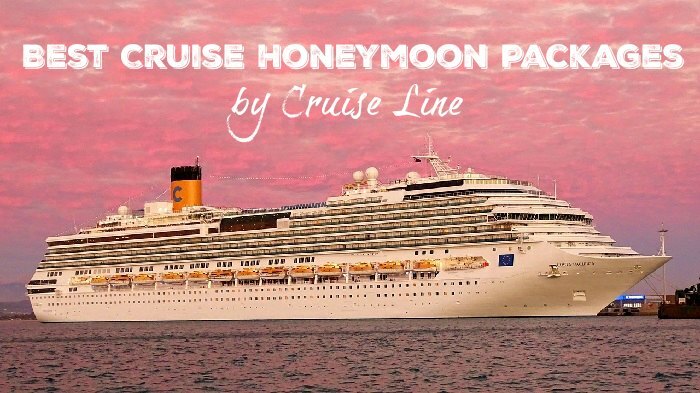 This is one of those cruise lines that offers a special package just for honeymooners. You can select any of their cruises, and then add the package to bring on the romance. The standard package includes a bottle of Dom Perignon, chocolate-dipped strawberries, two champagne glasses, breakfast on the balcony, and day passes to the on-board thermal suite. The price reflects a 10 percent discount over what you would pay without the package. Each of these cruise lines offer something unique for honeymooning couples. You have to decide what works best for you, and then book your trip as early as possible to get the best rates while maximizing the time that you have to prepare for your honeymoon.